One of two images of the Great House at Casa Grande, circa 1870, Carlo Gentile. Courtesy Library of Congress. This is desert weather Arizona, hot and dry in summer with day temps reaching over 100 degrees. Water is imperative, even on a short hike. In summer, consumming 1 quart per hour you hike is a good idea. It's often dusty and windy. In winter, high temperatures run between 60 and 80 degrees. Photo above: Great House at Casa Grande under the canopy built in the 1930's to protect it, 2004, John Dodds. Courtesy Wikipedia Commons. Right: Front door of the structure, 1937, John P. O'Neill, Historic American Buildings Survey. Courtesy Library of Congress. It was the first of its kind when designated on June 22, 1892 by President Benjamin Harrison, an attempt by the United States to protect the heritage and structures of the desert southwest Indian tribes. The Great House of the Hohokam Pueblo people, built prior to 1450 A.D., was one of the largest examples of a desert bed home structure. Today, it's protected by a huge canopy to keep the sun from its adobe and keep the building as intact as possible from the elements. The park itself is small, under five hundred acres, but the heritage here, as well as the experience in the interpretation of the rangers and the Visitor Center movie and exhibits should not be missed. But it does get missed these days too often, with just over sixty thousand visitors most years. Don't be one of those national park visitors to Arizona who miss the first example of heritage preservation of Indian culture. You won't be disappointed. Well, at least most won't be. 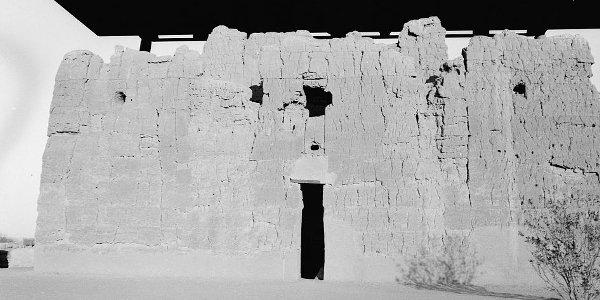 During the Hohokam period of the Pueblo Indian tribes of the Arizona landscape, a compound wall and structures were built for the families who farmed the Gila Valley. Farming, however, with residences in one place, was a relatively new phenomenon for the Sonoran Desert people, perhaps eight hundred to one thousand years old. They had lived in the area since 5,500 B.C. Although we sometimes think of the structures of the indigenous peoples of the southwest United States as solely living in cliff dwellings, there were desert based communities as well. 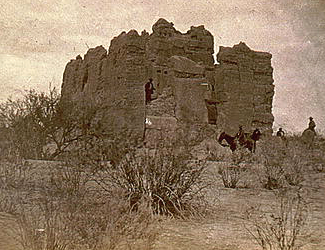 The Great House is the largest, four stories, example of the buildings at Casa Grande, but there are more remnants at Casa Grande Ruins National Monument than just that one building. It is the most impressive. Surviving seven centuries, the Great House has outer rooms around an interior structure. Jesuit missionary Father Eusebio Kino was the first European to discover Casa Grande, and name it, in 1694. Photo above: The Florence Stage, South Side of the Great House, 1888-9. Courtesy National Park Service. Below: Casa Grande Great House in current times, 2006, Greg Hume. Courtesy Wikipedia Commons. Due to the foresight of President Harrison in 1892, and Woodrow Wilson's elevation of the site to National Monument status in 1918, today, you can visit that Great House, and walk around the structure, just where the Pueblo people walked. Part of the reason why the Great House has stood that test of time was the ramada (canopy) built over it in 1932 by Frederick Law Olmstead, Jr., the son of the famed landscape architect, who with his brother continued the legacy into structures such as the Biltmore Estate and national park projects. You can not go inside the Great House. There is a Visitor Center built in 1937 that includes a movie and exhibits. Rangers will take you on a guided tour around not only the Great House, but other structures. At one time, there was a ball court here that rivaled the one at Pueblo Grande de Nevada. 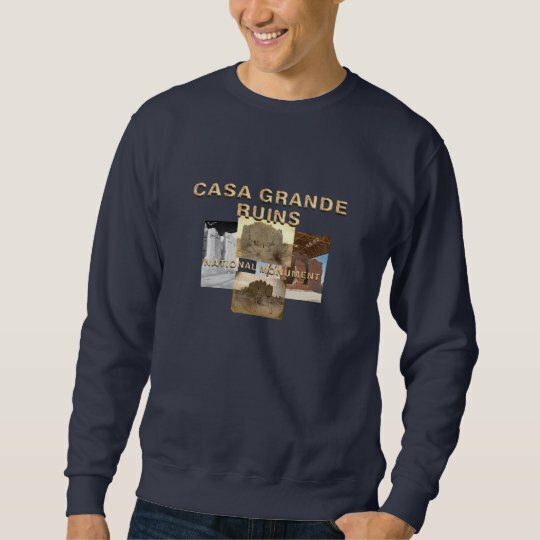 Casa Grande Ruins National Monument T-Shirts and Souvenirs from the official merchandise of America's Best History. 1. Take a ranger guided tour to the Great House. 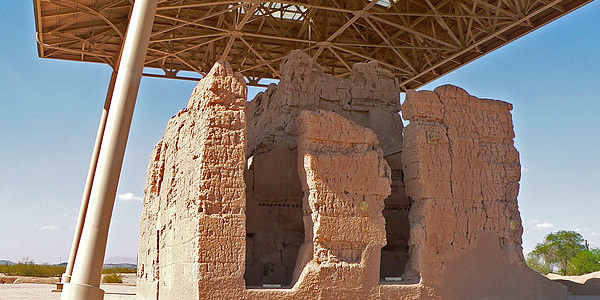 They'll tell you a whole lot about the structure, the Hohokam culture, and lots more. Unfortunately, you can't enter the Great House any longer, in order to protect it. 2. Orient yourself with the twenty-two minute film in the Visitor Center. It will give you a good heads-up on what you'll see once you enter the historic area. 3. Don't forget to look at the nature all around you. Depending on the time of year of your visit, the blooms of the desert cactus are a wonderful, calming addition to the history you'll be predominantly seeing here. 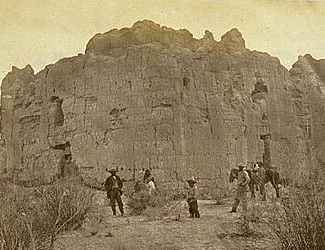 Photo above: One of two images of the Great House at Casa Grande, circa 1870, Carlo Gentile. Courtesy Library of Congress. Casa Grande Visitor Center - Built in 1932, but not finished until 1956, the Visitor Center building itself is a modern treat for the adobe fan. Inside, there are exhibits, bookstore, park orientation, and a twenty-two minute film. It's open year round, except for major federal holidays. Check here for the available ranger walks and talks for the day. They occur almost hourly in fall, winter, and spring. Great House - Four stories tall and built seven centuries ago, the Casa Grande Great, or sometimes called Big, House, can be visited, on the exterior only, through guided or self-guided tours. Historic Area - Wayside exhibits tell the story of the Hohokam cultures as you wander around your self-guided tour. 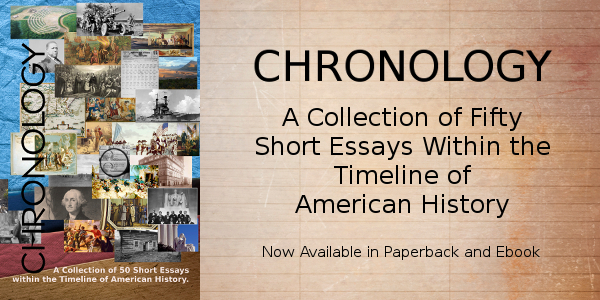 You'll learn about the Sonoran Desert people, the ball court, irrigation, and the desert. 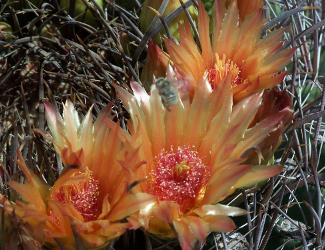 Photo above: Barrel Bloom cactus at Casa Grande. Courtesy National Park Service. 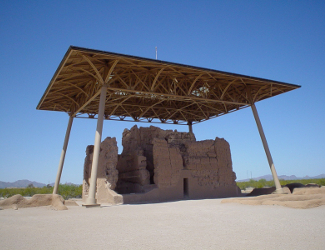 Casa Grande Ruins National Monument is located at 1100 W. Ruins Drive, Coolidge, AZ 85128. Where is that in relation to anything else? It's one hour up or down Interstate 10 from Tuscon or Phoenix, but actually a bit closer to Phoenix. Take the Coolidge exit from either direction; after that, signs will point your way to the park. 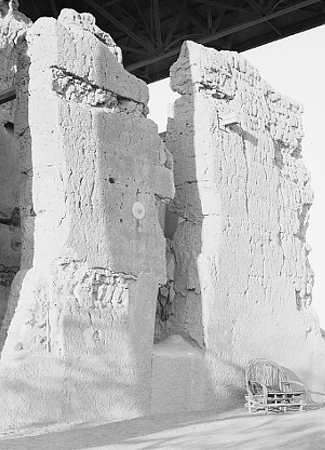 Photo above: Casa Grande ruins of the Great House, 1937, John P. O'Neill, Historic American Buildings Survey. Courtesy Library of Congress. 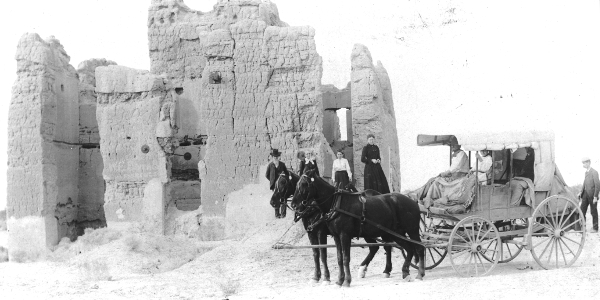 There is no lodging or camping inside Casa Grande Ruins National Monument. Coolidge, Arizona is a small town, but not mini, home to eleven thousand residents, and there are a few motels and hotels in town. Between Phoenix and Tuscon along Route 10, you should be able to find accommodations at most chain motels. Check your favorite online lodging site such as Expedia for the lodging type of your choice.